This September, start hunting for extra bonuses! Get $20 worth of promo codes for every friend you successfully sign up to drive with GrabHitch, AND… we’re giving you an additional $10 worth of promo codes for EACH September bonus criteria your friend qualifies for! Think hard, it’s time to reach out to your mahjong kaki, secondary school friend, your army buddy, colleague from another department or even your neighbour! Get your friend to input YOUR Grab-Registered Mobile Number (65XXXXXXXX) into the referral code field during the sign up process. Remember to encourage your friend to do ONE ride by 30th September 2017 to qualify for the rewards! Send this link: grb.to/newtohitch to your friend or get your friend to text us at 658429 9032 (Monday – Friday, 10am – 6pm) for assistance. Are you new to GrabHitch? Signing up as a GrabHitch driver takes <5 minutes, straight from your mobile phone! For enquiries on our Passenger Referral program, or if you have additional feedback on GrabHitch, please email us at : support.sg@grab.com with the Subject: GrabHitch PRD and we will get back to you in 1-3 working days. Alternatively, do text us at 65 84299032 (Monday – Friday, 10am – 6pm) for assistance. For more information about our previous Passenger Referral program, please click here. The $20 promo code for referrer / $20 credit for referred scheme runs from 1st September 2017 @ 00:00 hours – 30th September 2017 @ 12:00 hours. For our Hitch drivers who are also passengers – this Driver Referral program takes precedence over the this scheme, so your referral will be logged as a Driver referral instead of Passenger referral. Passengers will only receive their $20 worth or more of Grab Promo Codes if each referred friend successfully completes ONE GrabHitch rides as a driver by 12:00hrs on 30th September 2017. After the referred driver has completed his/her ride as a driver, please allow up to 10 working days after the incentive period has ended (ie. post-30th September 2017) for the $20 worth or more of Grab Promo Codes to be processed. Passengers can refer multiple drivers to get more rewards, so if you refer 5 drivers who all do 1 ride each, you’ll get $100 in Grab Promo Codes. If you refer drivers who meet at least one criteria outlined above, you’ll get additional Grab Promo Codes based on the criterion met for each referred driver. Drivers have to sign up with the Passenger’s mobile number (include 65 in front e.g. 6512345678) and do ONE successful GrabHitch ride as a driver by 12:00hrs on 30th September 2017 to count as a successful referral. After completing your 1 GrabHitch ride, please allow up to 10 working days after the incentive period has ended (ie. 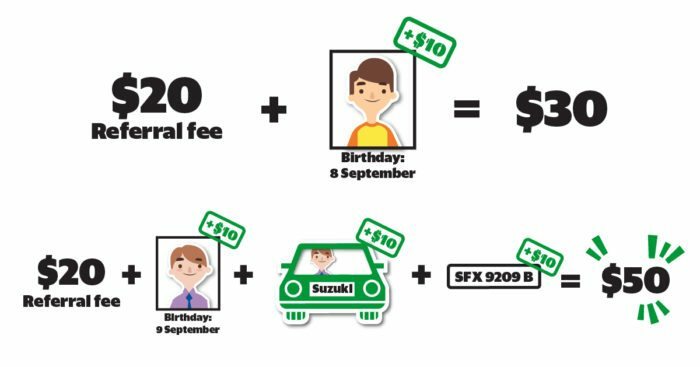 post-30th September 2017) for the $20 credit to be transferred into your GrabHitch driver wallet.